Comments Off on Excuse our dust! We are the awesome folks behind the 11th Principle: Consent!, which is an enthusiastic consent initiative born from the Burning Man community. By establishing Enthusiastic Consent, Inc., we are looking forward to expanding our reach outside of the burn and festival world with our new 501(c)3 non-profit organization. 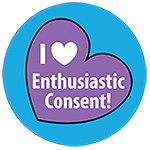 For now, please follow Enthusiastic Consent on Facebook & check out the resources on the 11th Principle: Consent website.